Michigan Lobbyists Disclosed Spending $690,000 On Food And Drink In 2016. The Public Can Track Who Benefited From Only A Portion Of That Spending. LANSING — The highest ranking member of the Senate, the chair of the House Health Policy Committee and a representative who helped lead the overhaul of state energy laws were among the top recipients of lobbyist-purchased meals last year. 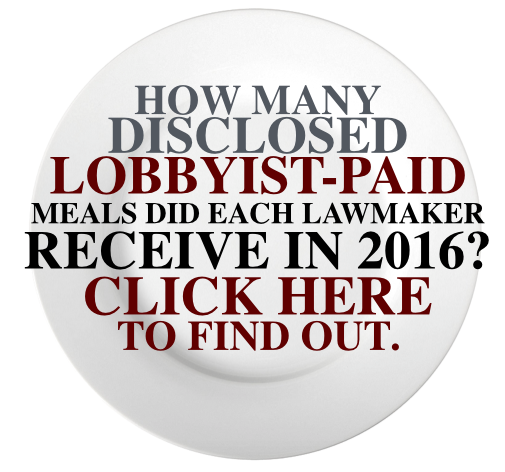 Lobbyists reported spending $690,681 on food and drink purchases in 2016 with 25 different state legislators identified as recipients of more than $1,000 in free meals each, according to the Michigan Campaign Finance Network’s (MCFN) review of new disclosures. The top target of lobbyist-purchased food was Rep. Mike Callton, a Republican from Nashville, who served as the chair of the House Health Policy Committee last year. Term limits forced Callton out of the House at the end of 2016. But in his last year in the House, he received at least $4,047 in free food and drink from lobbyists, according to their disclosures. The multi-client lobbying firm Governmental Consultant Services Inc. reported purchasing $1,081 worth of food and beverage for Callton. Insurance giant Blue Cross Blue Shield of Michigan, which is particularly interested in the activities of the Health Policy Committee, reported buying $832 worth of food and drink for Callton. Behind Callton on the list of the top free food recipients were Rep. Klint Kesto, a Republican from Commerce Twp., and Sen. Rebekah Warren, a Democrat from Ann Arbor. For the year, Kesto received at least $3,266 in free food and drink while Warren received at least $3,057, according to the lobbyists' reports. Like Callton, the top purchaser for Kesto and Warren was Governmental Consultant Services Inc., a firm that represents companies like Auto Owners Insurance, Consumers Energy and Mejier, to name a few. For comparison, according to Bureau of Labor Statistics research, the average American household spent $3,008 on food away from home in 2015. 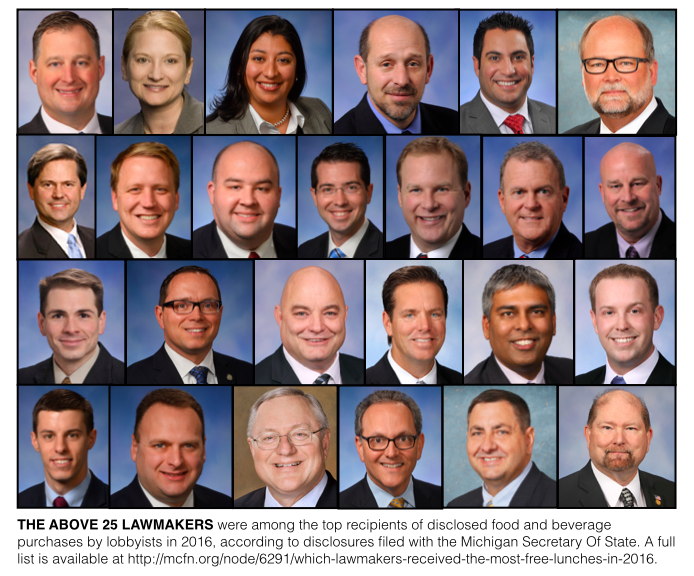 Other top 10 recipients of lobbyist-purchased meals for 2016 included Senate Majority Leader Arlan Meekhof, a Republican from West Olive, who placed fifth with at least $2,650 in free food and drink, and House Energy Policy Chair Aric Nesbiit, a Republican from Lawton, who placed eighth with at least $2,079. A full list of those who received free meals is available here. Governmental Consultant Services Inc. was the top purchaser for both Meekhof and Nesbitt. According to disclosures, Governmental Consultant Services Inc. was the top purchaser of disclosed food and drink for 49 different lawmakers last year, a third of the Legislature. Because of Michigan’s lax transparency laws, it’s impossible to know what interest groups the firm was representing when it purchased $1,081 in meals for Callton or meals for any other lawmaker. It’s also impossible to determine what bills the firm’s lobbyists were discussing while sharing $1,187 worth of food and beverage with Meekhof. Michigan’s laws also make it easy for lobbyists to avoid having to disclose whom they bought food for as long as they avoid the reporting thresholds. 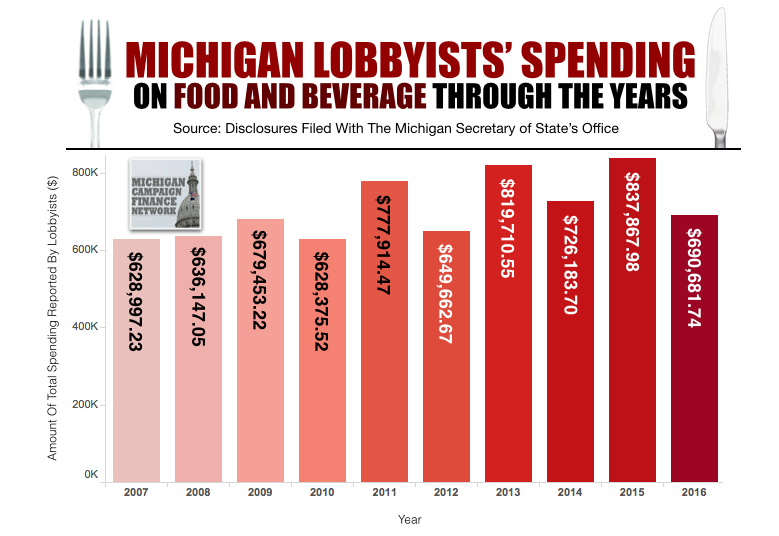 According to the Michigan Secretary of State’s Office, lobbyists only had to report the name and title of a public official they purchased food for in 2016 if the purchases amounted to more than $58 in a month or $350 for the year. For comparison, according to an online menu, a bone-in filet at the popular downtown Lansing restaurant Troppo costs $39.95 — below the $58 threshold. So while lobbyists reported spending $690,681 on food and beverage in 2016, their reports list specific recipients for only $227,337 in spending. Lobbyists reported spending $90,268 on buying food and drink for identified individual state officials and $137,069 on buying food and drink for identified groups of state lawmakers. Those group purchases included food for receptions, legislative session days and outings. For instance, DTE Energy reported spending $1,000 on a reception coinciding with Gov. Rick Snyder’s State of the State address on Jan. 19, 2016. Blue Cross Blue Shield of Michigan reported spending $216 on “snacks/beverages” for the Senate Republicans on March 21, 2016, and $503 on lunch for the House Republican caucus on Dec. 7, 2016. AT&T disclosed having a “holiday reception” for lawmakers on Dec. 6, 2016, spending $4,800. And Governmental Consultant Services Inc. reported buying food and beverage “during session” on the last day the Legislature met in 2016, Dec. 15. Lobbyist spending on food and beverage tends to dip in election years compared to off-years. In election years, lawmakers tend to spend more time in their districts campaigning, leaving less time to eat out in downtown Lansing. So in 2016, the total amount that lobbyists reported spending on food and drink was down from the record year of 2015 when they reported $837,867 in food and drink expenses. Still, 2016 ranks fifth in state history for the amount of lobbyist-purchased food and beverage. And, as MCFN reported last week, 2016 also saw the most overall spending by lobbyists — including all aspects of lobbying — in state history. Multi-client firms that represent a wide range of interest groups have helped drive up spending on lobbying, and they’re are also among the top spenders on food and drink for state officials. According to the disclosures, the top four purchasers of food and drink for 2016 were all multi-client firms: Public Affairs Associates ($83,265); Kelley Cawthorne ($79,576); McAlvey Merchant and Associates ($43,137); and Governmental Consultant Services Inc. ($40,498). Who Bought Trips For Lawmakers? While it can be easy for lobbyists to avoid disclosing whom they bought food and drink for, there’s a similar threshold for reporting trip purchases. According to the Michigan Secretary of State’s Office, only lobbyist-funded trips that cost more than $775 must be reported. Lobbyists report on their spending twice each year: on Aug. 31; and on Jan. 31. The August report covers January through July. The January report covers August through December. While there were 15 trips disclosed in the August reports (you can read about them here), there was only one trip for a state lawmaker disclosed for the last five months of 2016. Amaya, a gaming and online gambling company, reported spending $1,411 on Sept. 1 for Meekhof to travel to tour its facilities. Senate Majority Floor Leader Mike Kowall, a Republican from White Lake, introduced a bill on April 14, 2016, to allow online gambling in Michigan. He’s reintroduced a similar package in 2017.